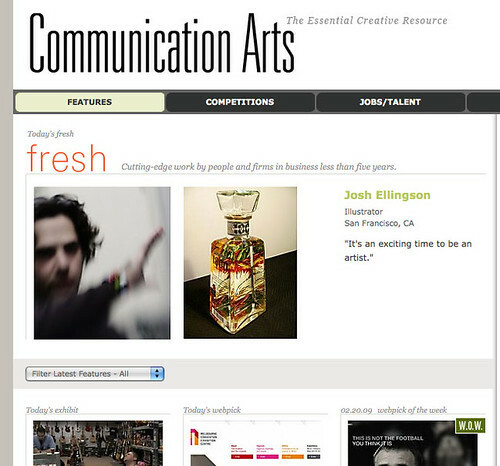 Congrats to San Francisco artist Josh Ellingson, a long-time friend of Laughing Squid, on being featured in the Fresh section of the Communication Arts website. CA is the largest international trade journal of visual communications. 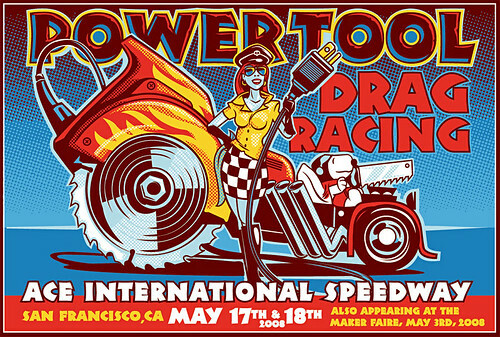 Bay area art fans with their eyes open have probably noticed Josh’s work in recent years in local weeklies, major magazines, posters for parties and concerts, or galleries and stores in San Francisco and beyond. 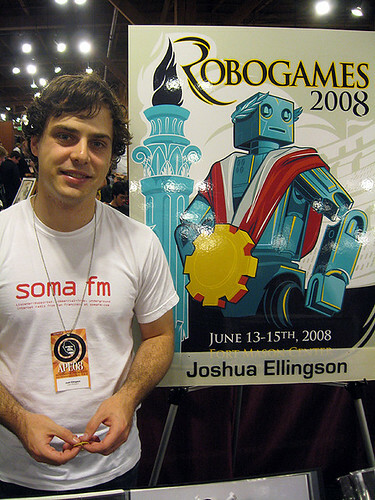 Josh has designed ads, posters, and postcards for Laughing Squid over the years, too. 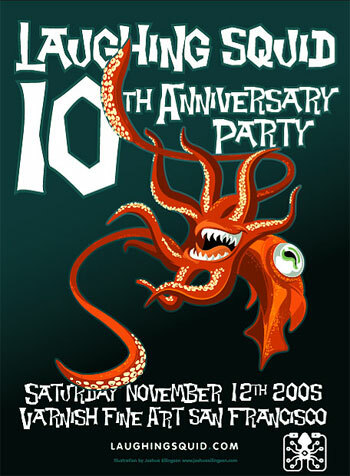 The image below was one of the first in the Laughing Squid postcard series. Josh will be at the Wondercon convention this week in San Francisco at Moscone Center South, you’ll find him in Artists’ Alley. He’ll have some new prints, making their exclusive debut at the convention. I’m influenced by popular culture, particularly television and movies, and I’ve also always been a fan of comic books and collectible toys. I’m enamored with science and scientific advancements and lately, astronomy has had a big impact on my work. There’s something about the scale of the cosmic level that makes my brain buzz. Josh has had exciting things happening. 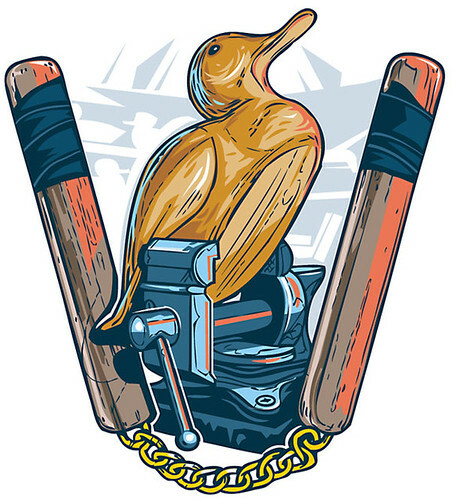 In addition to the CA feature his work has recently appeared on TV, in art shows in Arizona & South Carolina (upcoming), on limited edition tequila bottles, and in outer space. So it seemed overdue to cover some of the cool stuff he’s been up to since Scott last posted about him in July ’08. First off, that art-in-space thing. 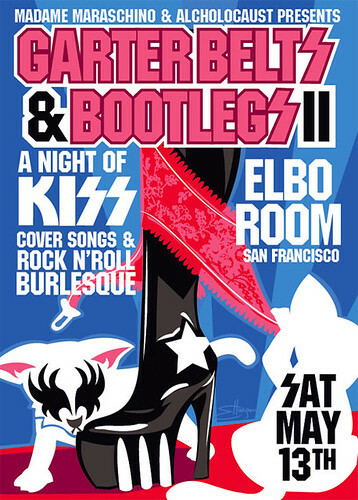 The illustration below, featuring burlesque icon Dirty Martini was chosen to be included in the first ever art show at the International Space Station, which is in orbit around a small blue planet called Earth. There it is, over the shoulder of the ‘naut on the far left. 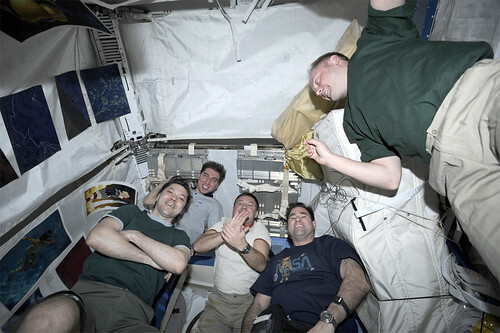 Possibly the first Dirty Martini in space. Not likely, but possible. Last month back on Earth, fellow bay artist KRK Ryden curated a show called “The Panelists”, featuring art that celebrates the comic book panel. 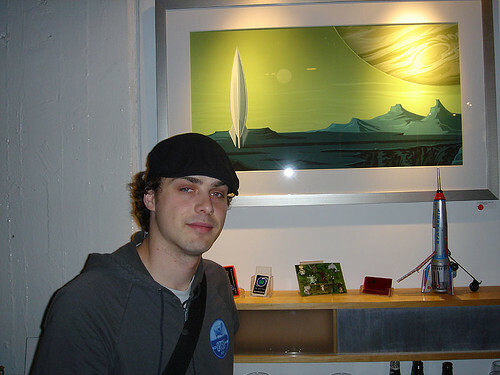 It happened at Pravus Gallery in Phoenix, Arizona, where Josh’s work appeared alongside pieces by KRK, Mark Mothersbaugh, Niagara, Mark George, and many others. Back to last year, Ellingson-on-television happened in a surprising meeting of Reality TV and a Great Old One. 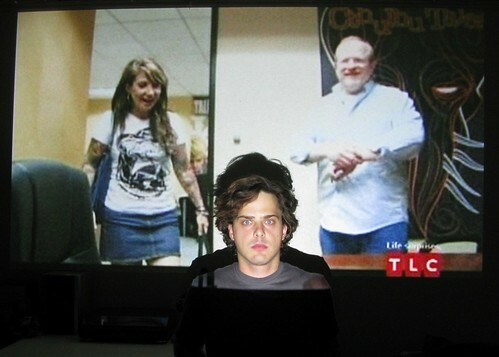 The TLC show LA Ink shot a scene in the offices of Boom-Studios who happened to have Josh’s artwork on their walls. 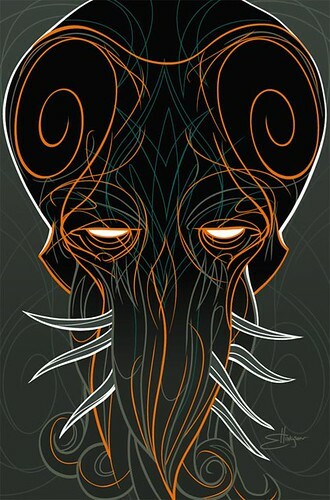 In fact it’s the cover art Josh designed for a comic that Boom published called Cthulhu Tales: The Rising. The door-sized image hangs proudly in their conference room. Josh heard about it on the night of the show, and quickly ballyhooed it up on Twitter. No slight on Josh, but it’s rather a handsome take on Cthulhu, don’t you think? 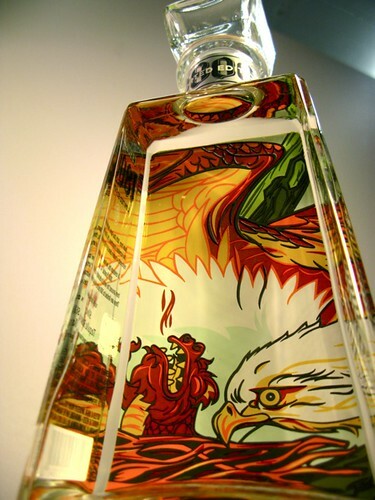 Saving the boozed for last (or penultimate anyway), last year Josh also got a high profile, high concept gig, when he and a few other artists were selected to design custom bottles of 1800 tequila. What results are some really stunning alcoholic vessels. 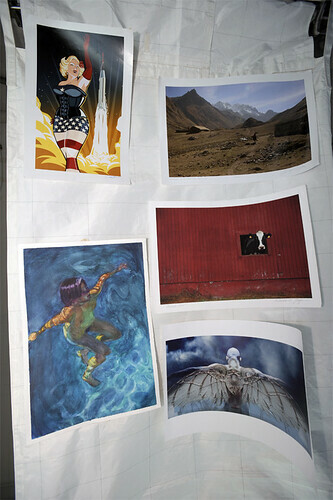 Josh has more pix on his flickr stream, including shots of the billboards and sneakers that 1800 made of his work. NOTCOT.org has a post with great pix of the collection. The original artwork is entitled “Eagle with Baby Dragons” (below). This April you can go check out the Ellingson atelier in person when the Spring 2009 Mission Open Studios is on. Josh works out of the bustling 1890 Bryant Street Studios where he shares a large space with several other great local artists and the granddaddy of internet radio stations SOMA FM. Together they call themselves Local 303 and next month marks their 3rd anniversary in the space. Here’s some pix of their work and play over the years. Okay, Josh, don’t do anything else for a while, okay?